Calderdale Riding for the Disabled is a new group running at Meadow View Stables at Ogden. The Riding for the Disabled Association (RDA) is a charitable organisation supporting disabled people with a variety of physical and mental disabilities since 1969. Through interaction with horse, known for their empathy and therapeutic qualities. CRDG are currently working with Highbury School providing enrichment activities for the children who attend. The children have Special Educational Needs and Disabilities (SEND). Volunteers are required in different roles and currently CRDG are recruiting a fundraiser. Keep an eye out over the coming weeks for other more ‘hands-on’ roles such as sidewalkers and leaders. 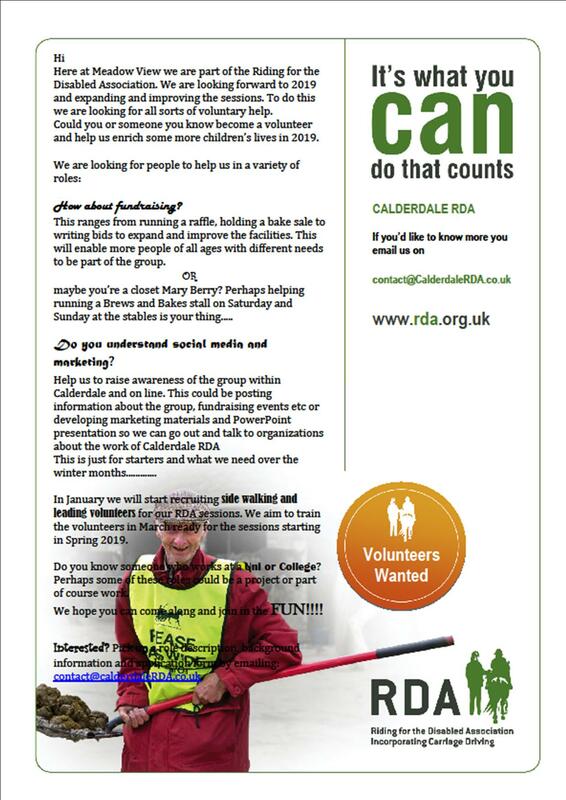 Purpose of Role: To raise funds to support the provision of RDA (Riding for the Disabled Association) sessions. Main Activities/Tasks: To help with ideas and actively raise funds and awareness of the group. This ranges from running a raffle or holding a bake sale, to writing bids to expand and improve the facilities. The money raised goes towards keeping the sessions subsidised, buying specialist equipment and helping towards the up keep of the horses. We also need to improve the toilet facilities and build a ramp for wheelchair users, to enable more people of all ages with different needs to be part of the group. These large items require a different approach. We need help setting up Every Click, Just Giving and crowd funding. Qualities and Skills: Experience of fundraising is an advantage but not essential. Bright ideas and a desire to help ensure sessions can continue is just as valuable. Training Provision: Meet, greet and familiarisation app. 2 hours. Further training to be agreed after initial session. Availability needed: Adhoc around events etc.